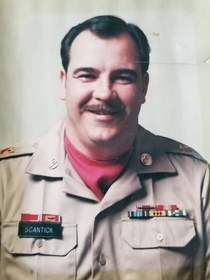 George M. Scantick Sr. passed away April 11, 2019 surrounded by his loving family. George was born May 11, 1945 to the late Michael Marino and Beulah Mae Cropper Scantick in Marcus Hook, PA. Throughout George’s childhood he was raised primarily by his Aunt Ethel and Uncle Robert Carver Sr. of New Castle, DE. George was a Veteran of the U.S Army having served during the Vietnam War; George was a Training Specialist at Aberdeen Proving Ground in Aberdeen, MD at the Ordinance Center School. George served as past Post- Commander of the Weedon-Elliot V.F.W. Post No. 8126 of Havre de Grace, MD and was a member of the Susquehanna American Legion Post No. 135 of Perryville, MD. George enjoyed a number of passions: traveling around the world to Germany, Iran, Korea, Panama and many more destinations; boating, building cars, working on trains and motorcycles. George is survived by his loving wife Debra Ann Scantick whom he traveled the world with for over 40 years; his two children, son, Tony Marco Scantick, and daughter, Dominique Nichole Hughes and her husband, Cody Skylar Hughes; and two granddaughters Savannah and Harper. George is also survived by his niece Tiffany Carver O’Malley of Lewes, DE. George is additionally survived by a host of countless friends that he influenced along the way. Funeral Services are scheduled for Friday, April 19, 2019, 10 AM, at the Lee A. Patterson & Son Funeral Home, P.A. of Perryville, MD. Visitation for family and friends will be held Thursday, April 18, 2019, 7 PM to 9 PM, at the funeral home. Pastor Dr. Harold Phillips of the Pleasant View Baptist Church of Port DePosit, MD, will officiate. Interment will be in the Arlington National Cemetery, Arlington, VA.